One of many benefits that our serviced apartments in Chelsea offer is that our superb selection of studio and one-bedroom apartments are conveniently located in the heart of Chelsea. Despite all our serviced apartments being equipped with modern fitted kitchen sometimes you just feel like dining out. With such a variety of amazing restaurants on your doorstep, Chelsea offers a range of fantastic restaurants. 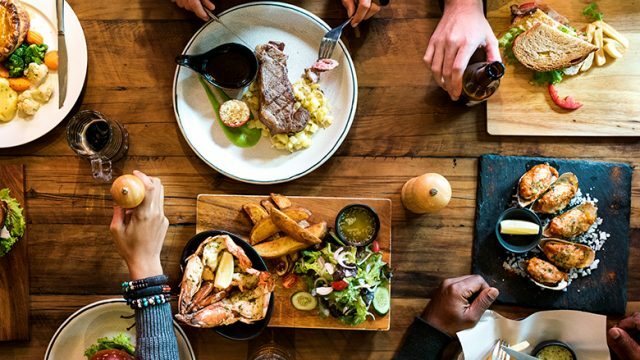 Whether you’re in the mood for some Italian, British, or Argentinean cuisine, here is some of our favourite restaurants. Offering contemporary British and modern European cuisine, the Bluebird Chelsea is located on the bustling and trendy King’s Road. It is one of Chelsea’s favourite amongst both locals and tourists and comprises of a bar, café and a restaurant. Whether you’re after something sweet or savoury why not satisfy your taste buds and head to Bluebird today! Did you know you can book an Afternoon Tea for two? Perfect for Mother’s Day coming soon! Guacho on Sloane Avenue is an Argentinean steak restaurant chain where you get to experience the delicious flavours of Latin America. From mouth-watering empanadas to spicy ancho ribeye’s and sweet cinnamon churros, you’ll can enjoy a variety of delicious dishes. So, whether you’re a lover of steak or taking a break from shopping then Gaucho is a great place to treat yourself! Rabbit is located in the stylish Chelsea neighbourhood and is a ‘farm to table’ kind of restaurant. A British restaurant serving wild food, set lunches and traditional Sunday roasts. It is run by the Gladwin Brothers who own a few other restaurants and their menu consist of local and wild British produce and sustainable livestock from their own farm in West Sussex! Caraffini is a mere short walk from Sloane Avenue station (just like our apartments) serving authentic Italian food. The lovely restaurant was founded in 1994 and their menu captures the unique and delicious flavours of Italy. Shopping in King’s Road can be tiring so if you want to try some traditional cuisines and experience fine dining then why not try Caraffini’s for your next treat? Benihana opened their doors in 1964 and have since grown in popularity. Their menus consist of Benihana ‘traditional’ dinners such as Wagyu Beef and unique desserts such as Black Sesame Ice Cream. The restaurant offers a great selection of great dishes and a charming place to enjoy delicious Japanese cuisine. The Good Life Eatery offers healthy and delicious food. Co-founders Yasmine Larizadeh and Shirin Kouros launched their successful company on Sloane Avenue in 2013. You can tuck into a choice of superfood salads including gluten free and vegan options, quinoa falafel wraps, tomato and cheese on spelt croissant, a warm bowl of stew and refreshing cold pressed juices as well as baked treats! All of these places are close to our serviced apartments in Chelsea!